This is a variation I have been seeing lately. Sometimes instead of 4 I see b. 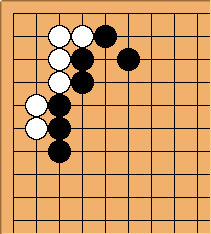 This is exceptionally frustrating since it usually happens when I want to play c. ( Usually because I have some stones nullifying the ponnuki, and am able to make great use of the thickness. I could respond with a but it seems like I've given up more than I had to. Bill: is plainly kikasare. Suppose that Black does continue at a. Black can be satisfied with hemming White in on both sides. 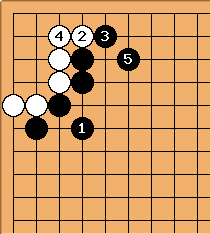 White is thoroughly surrounded. threatens to kill. Later, - threaten seki. 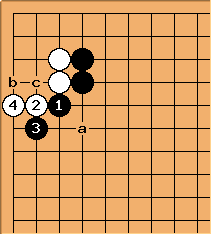 (The last sequence is ambiguous, since is worth 3 points by miai counting, the same size as Black's hane-tsugi.) 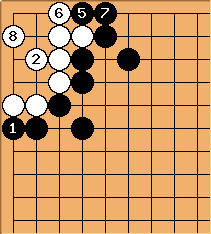 White's corner is worth only 6 points.